Podge Gets Fat, Thin And Fat Again! My final, and lengthy(! 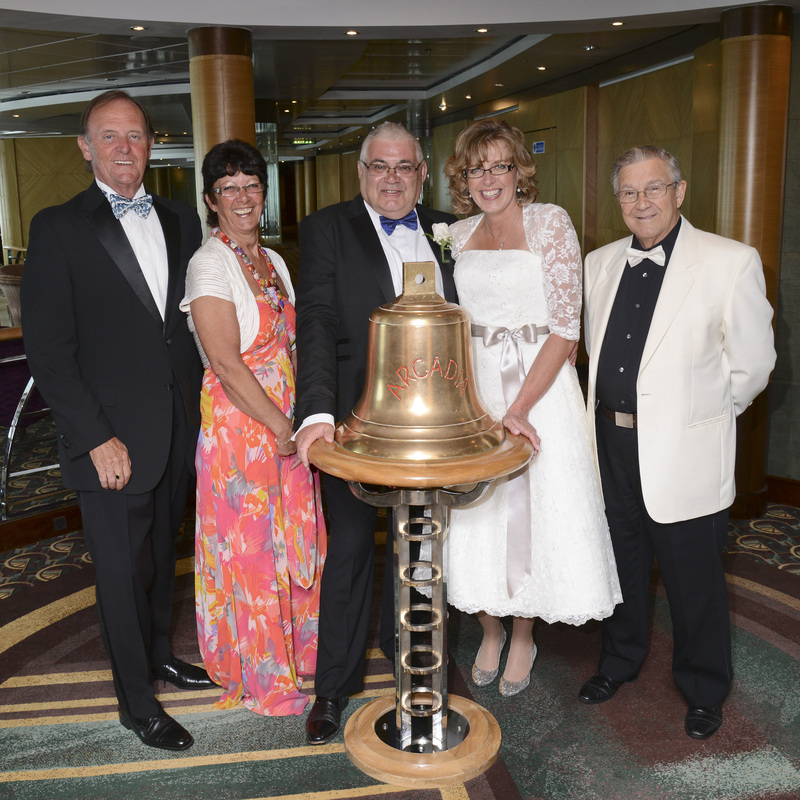 ), post of our Wedding Cruise. Drug trafficking in Singapore is punishable by [Death]. Now, for those that know me, they won’t be surprised to hear me say that I’m a bit of a pill head. If I think it’ll do me good, I’ll take it: And of late, I’ve been trying various products to help combat the effects of COPD. So, before I left, I filled up 5-weeks worth of pill organisers. Of these, the morning and evening pills included 4 prescribed pills plus others that I [knew] I should take: along with a whole load of others (most of which I couldn’t remember the purpose, or name, of) that were ‘essential’ in maintaining my health & keeping me alive :-). Now, with the excitement of the holiday, while I would remember, most of the time, to take the morning and bedtime drugs, it wasn’t unusual to forget many of the others. The result of this was that as I approached Singapore I had 20+ pill organisers randomly filled with all sorts of tablets, most of which I couldn’t answer as to what they were. On top of this, I also take Codeine (occasionally) and I knew that was banned in Thailand and Dubai so; was it banned in Singapore as well? I knew not, so what was I to do? Would they ‘sniff’ out these drugs? What would they do? Would they lock me up and quiz me for days? Would they subject me to special searches (the type with rubber gloves)? Would I ever see my loved ones again? Would I be put to death? I started to worry. In fact, my worry was so great that I needed to go to the bar to think about my next course of action. Take one complete pack and argue my case. Option 1 brought with it too much risk. If I got caught, what would happen? Worse case – I could get machine gunned for drug trafficking, and I would die. Option 2 was a safer option on a personal level but if Mrs Me was caught, who would iron my shirts? Who would remind me to take my tablets without which, I might die. Option 3 was quite clearly an over reaction (why?, they’re only vitamins for goodness sake) and it would leave me without my prescribed mediation for 3+ days and I might die. 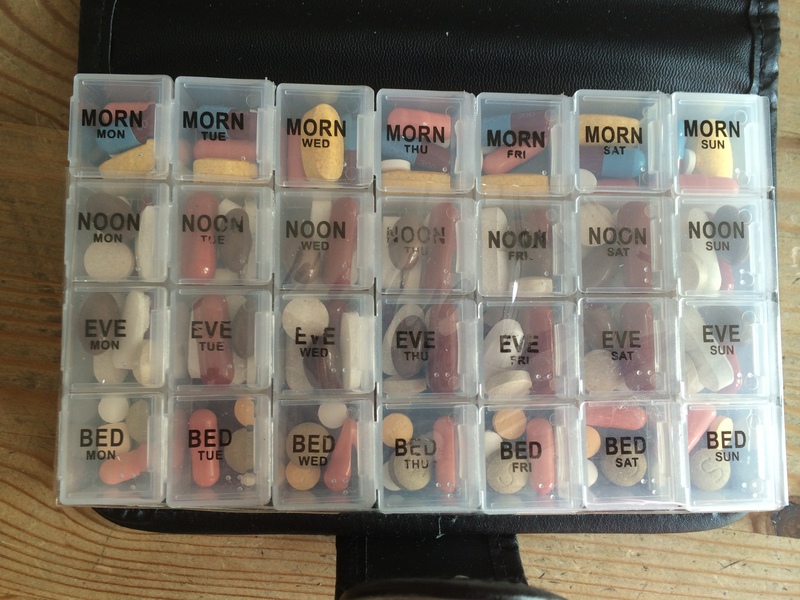 Option 4 seemed ok, but would they ask questions as to why I have so many pill organisers for just a few pills. They might be suspicious, lock me up and ask me all sorts of questions, and still perform those special searches. And then machine gun me anyway, and then I’d die. Option 5 seemed the better one, I could argue the case for the prescribed drugs and, hopefully, convince them of my rationale for the others, even though I myself had forgotten what that was. There was also the chance I might not die. So, after two or three glasses of Rioja my mind was a lot clearer(!). I would elect for Option 5. This was all the more better knowing that I had no codeine left as I had eaten the last lot over 72 hours ago. Assured by such knowledge I was confident that I had made the right decision. But first, Mrs Me had to be divested of all traces of Chewing Gum (she was a prolific chewer of gum). I did consider a ‘Special Search’ just to be sure but thought better of it. I then went through all my pill organisers and thew away all untaken drugs leaving just one complete pack. This was wrapped in a serviette that ‘may’ have been borrowed from the restaurant and surrounded with our stash of P&O Chocolates, which were placed on our pillows every night. All was then packed into the middle of my larger suitcase. Well, I think it was mine. With that, all cases were placed outside our cabin so that they might miraculously disappear overnight and subsequently taken ashore for when we disembark. The next morning, we breakfasted at leisure as our disembarkation time was not until 13:00 – This gave us even more time to leisurely ponder our future. As the minutes and hours ticked by, there were numerous calls over the PA System for Mr / Mrs So and So to contact reception. Had they been found to have suspicious items I wondered, or had they simply not paid their on-board account? Naturally, my fear was of the former. Eventually, the allotted hour was upon us and still, we hadn’t been called. I was feeling confident. As we made our way ashore, I scanned the area looking for guards with machine guns, sniffer dogs, anything that might indicate trouble ahead. All I could see however was a long queue of disembarking passengers collecting their luggage, as we had to, then waiting to be waved into the next available immigration control point, complete with full luggage x-ray machines. This was it, I just knew we’d be found out. How was everybody else getting through ok? I asked myself. Surely, I’m not the only one who takes drugs, oops, I mean tablets. One other problem though. Despite there being two ships in today, both disgorging passengers (the other was a Crystal Cruises ship), there was only one immigration point open. This could, I thought to myself, work in our favour. As time ticked by, people were becoming more and more frustrated: there were at least a dozen immigration points yet there was only one operating. It was almost like trying to get back into the UK via Heathrow :-). Eventually, the authorities relented and opened a second desk so as to clear us as quickly as possible. Within no time at all, it was our turn. How should I play this. Should I look normal? What does ‘normal’ look like? Whatever I did, I had to be sure not to look nervous: they can spot nervous people and might single them out for closer inspection, I thought to myself. Then, it was our turn. A young lad, in uniform came up to help place our suitcases on the belt that would take them through the x-ay machine. Br careful I said, they’re full of fragile ornaments that Mrs Me has bought I said. He turned and smiled as if to say, Don’t worry, I’m used to this and in no time at all, they were loaded and on their way. I stood and watched, oblivious to the fact I was being called for to walk through the sensor and then onto have my passport checked. It was it this point that it became evident to me that I had no cause for worry. The immigration officer couldn’t have been more friendly. Welcome to Singapore he said. How was your cruise? he asked. It was great he I said, we got married, I said, pointing to Mrs Me who was waiting in the queue. Be careful, I said, she’s very bossy. Ah he said. That’s what happens when they get married, he said. You are now a ruled man, he said and with that, a look of sympathy, he waved me through. And with, we were through to join our coach that was to take is to Swiss Hotel, Merchant Court. Conveniently, the hotel was located right by the river and handy for bars and restaurants. 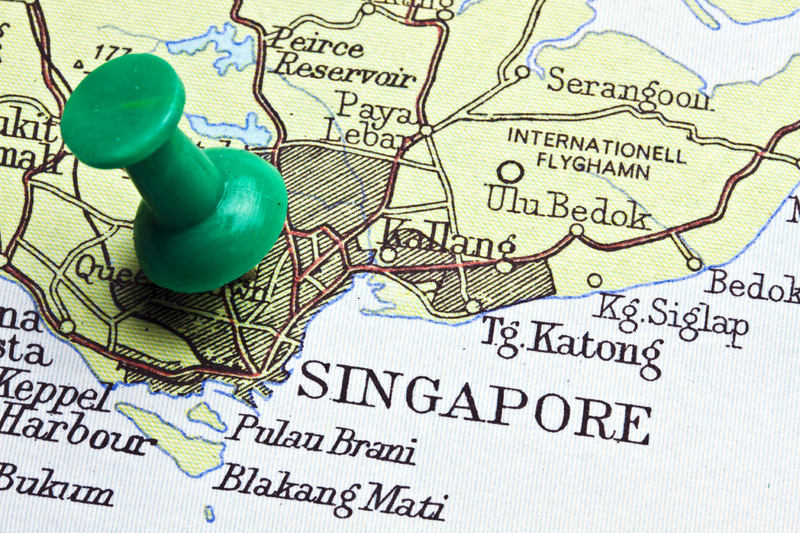 Perfect for those short exploratory walks out and about as we check out the surroundings and get a feel for what it’s like to be in Singapore. So, once in our room, and checked all suitcases were intact, complete with medication, our next task was to check out the bars and decide where we could have a late lunch. Our first port of call was the Octapas bar on the directly opposite side of the river. Sitting by the river, we were able to enjoy a welcoming cool beer (it was very, very hot & humid in Singapore) while watching the boats go by on the river and the rather fetching waitresses going about their business. Hmm, I say, I think I’ll take a couple of photos of the girls (just for the boys of course). It was just at that point that I felt that now familiar stinging to my left ear. Why, oh why, does she always go for the already cauliflowered ear? As we sat and drank, we looked at the map to work out what we were going to do over the next couple of days. We (I) worked out that the best strategy would be to take a boat to Marina Bay from where we could explore the Gardens by the Bay and then explore Marina Bay Sands Hotel and nearby Shopping Arcade (the last bit was the clincher). On the following day, we would be able walk to Raffles Hotel to enjoy a Singapore Sling as it should be enjoyed: in Singapore. And with that we went to explore the remaining bars while looking for somewhere appropriate to eat. Not long after leaving Octapas, we came across Hooters, this was another where I was to receive another thick ear. 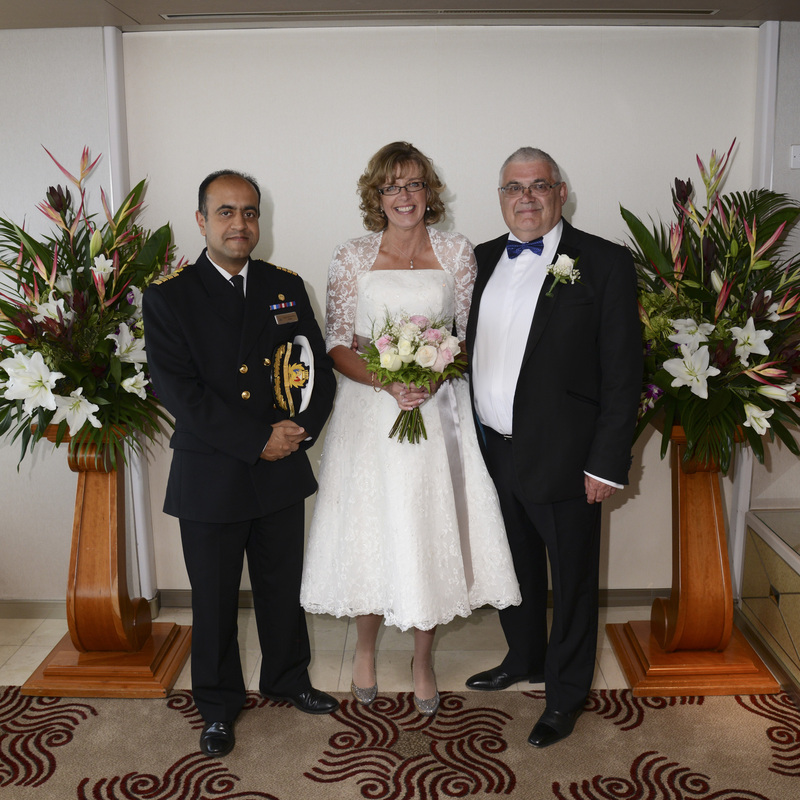 But wait, who did we espy but Adrian the ships photographer who took our wedding photo’s. I could do nothing. Mrs Me made a bee line for the poor man. Ooh Adrian, exclaims Mrs Me, what are you doing here? What Adrian said next brought me out into a cold sweat. But I, rather meanly, laughed as well. It would appear that as he (Adrian) was leaving the ship, he along with another crew member – the ships butcher (both of whom were contracted for the whole world cruise, and beyond) apparently triggered one of the sensors that picked up traces of a mysterious compound; a compound normally associated with explosives. With this, both the passenger and the photographer were bundled into an interview room where they were to cross examined for 3-hours as the authorities tried to establish why there trying to come into Singapore. Him being a ships photographer and ‘armed’ with nought but ships photographic equipment (that’s a camera to us mere mortals) seemed too little to convince them. But try as they might, they could ‘prove’ nothing. By the end the session, all that could be gleaned was they been detected as having traces of some black powder about them and all they could work out was that it had something to do with chemicals used in the photographic labs. With that, they let them go, leaving them with just half a day to explore before returning to the ship before she sailed for Kuala Lumpur. So naturally, they went to Hooters for a couple of drinks. That was when I got another thick ear for laughing at Adrian’s misfortune. Hmm, methinks Mrs Me has a soft spot for Adrian. After this, we felt the need to eat but couldn’t decide what we wanted. We walked up and down the riverside and up and down the side streets to see if there was anything that took our fancy. There was, of course Spanish, at Octapas, but there was just about every other nationality including local varieties. We were so overcome by it all, we settled for McNuggets & Fries :-). Our evening meals, we had decided, would be taken at the Blue Potato Restaurant by the hotel pool on the 2nd floor. It was a good decision. The food was exceptional without being expensive and the service second to none: a recurring theme throughout Singapore. The next morning, as planned, we caught a river boat to Marina Bay. During the trip, as a dutiful tourist I took many photos as did our friends, possibly from China, who were also visiting Singapore. As they moved around the boat taking various photos with each other we desperately tried to move out of their way until, in the end, I decided to join in and get in as many of their photo’s as I could. They seemed ok about it and we are still happy and smiley when we disembarked. Mrs Me and I now had to catch another boat to take us across the bay to the Gardens by the Bay. As our new Chinese friends they all moved together for a group photo of themselves with the bay and the hotel in the background. Beckoning me, I thought they wanted me to take their picture for them but oh no, they wanted me to be in their photo. So, back home, I’m probably described as ‘ooh look, here he is again in this picture – the old fat english man – he was everywhere’. Anyway, we reached the gardens and having bought tickets, we joined a tour which took us for a quick 20 minute exploration of the gardens while listening to how they were constructed. I won’t go into the detail, they can describe that better than I on the website here. But I have to says, it was something else: a place to visit over and over again. I was even more amazed to find it was only completed in 2011. Through these gardens it was possible to explore different regions of the world. You could even explore them from high above the canopies though Mrs Me did stay close to the point from where you joined this amazing walk across the sky. Having scampered here there and everywhere we then moved inside where it was amazingly cool so that plants not liking such warmer climates could also be nurtured. Again, these could be seen from ground level and canopy level, and all levels between. The following day was checkout day (boooo) though our flight wasn’t until 11:00 in the evening so we still the whole day to play. So, bags packed, we checked out of the hotel and left our luggage with the porter and off we went to find the Raffles Hotel. It was in fact only a 20-minute walk so in no time at all we found it, just in time for a lunchtime drink. Having checked out around the hotel we found the stairs that took us to the famous Long Bar , birthplace of the Singapore Sling. I’m bored now, so, now we’re off now to book our next adventure. 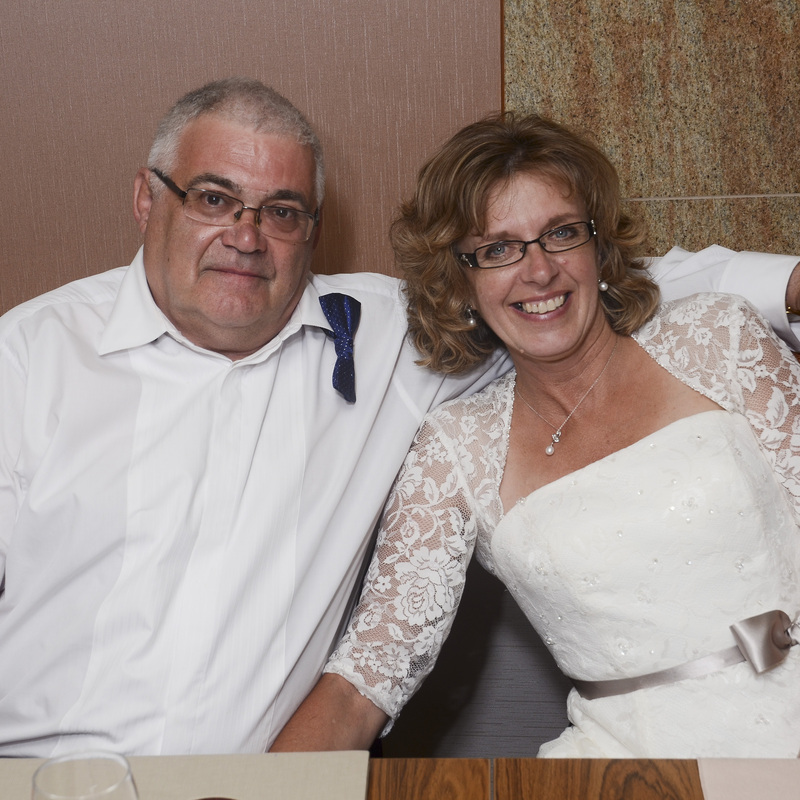 So, the long awaited day had arrived: that day was, by the way, March the 4th 2014. The day when Debbie agreed to me becoming her Husband. Ten years in the waiting, neither of us really knew how we wanted the day to be but we did know that we didn’t want it to be a church wedding. Equally, we didn’t want it to be a big ‘let’s shout it out’ wedding. It would be a quiet affair and the quieter the better. Now, earlier last year when browsing through the cruise brochures, as was our want, we spotted a cruise that would take us from Auckland in New Zealand via Sydney, Melbourne, Adelaide, Perth & Bali to Singapore. The significant aspect of this was Adelaide, where Debbie’s eldest boy, Matt, had spent some time at university but, more importantly, had entered a big race, sponsored by the Alphutte Restaurant, beat the Aussies and won it. Debbie so desperately wanted to see the trophy with her boys name on it. Obviously, the whole trip had its attractions not least of which was the chance to see, stroke, even hold, a Koala. So that was it, our minds made up, we booked the cruise, with a three night stay in Singapore afterwards and the countdown begun. Some while later, and we’re talking months here, we both, simultaneously posed the idea of getting married at sea and the Australia cruise would be the ideal time to do it. That was it: minds made up we put the wheels in motion with P&O and that was that. 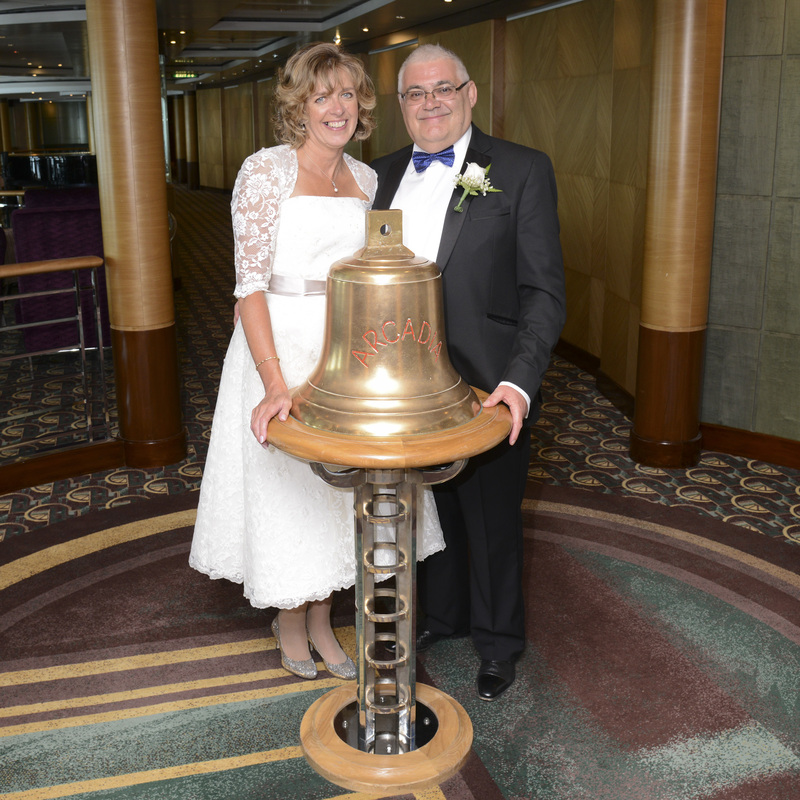 All we had to do, was join the ship, await the allotted day and, knowing that P&O would ensure all happened as it should, dress up smart and turn up and get married. Obviously, it wasn’t that straight forward. Debbie would need a dress but we felt that there was no hurry and we could get one in January. January came and come the middle of the month, we were starting to worry that Debbie would not find a dress. She knew she’d seen an Alice Temperley number she liked so off to Bicester Village we travelled and lo and behold, there was that very number in the shop, and, it was the right size. Yay I said, buy it and lets go to the pub for a drink to celebrate. Nay she said, lets look at the other shops to see if there is anything better. Nay I said, buy it and lets go to the pub for a drink to celebrate. Nay she said, in a tone that suggested that she was right and I was oh so very, very wrong. OK I said, let’s look at ALL the other shops, then, lets go back to Alice Temperley and buy it and then go to the pub to celebrate. I was walking on thin ice I know but, I got away with it. I won’t go into the number of shops we visited, check out Bicester Village website to get an idea, but it was a lot, and it was cold and it was rainy and I was a broken man. But, I knew I was right and this knowledge kept me going. Eventually, having looked at just about every handbag in every shop but no dresses we went back to Alice Temperley and bought the dress. We then went back to the pub to celebrate, except the pub was closed so we went straight home for a cup of tea instead. But not to worry, we (she) had the dress and all was well. 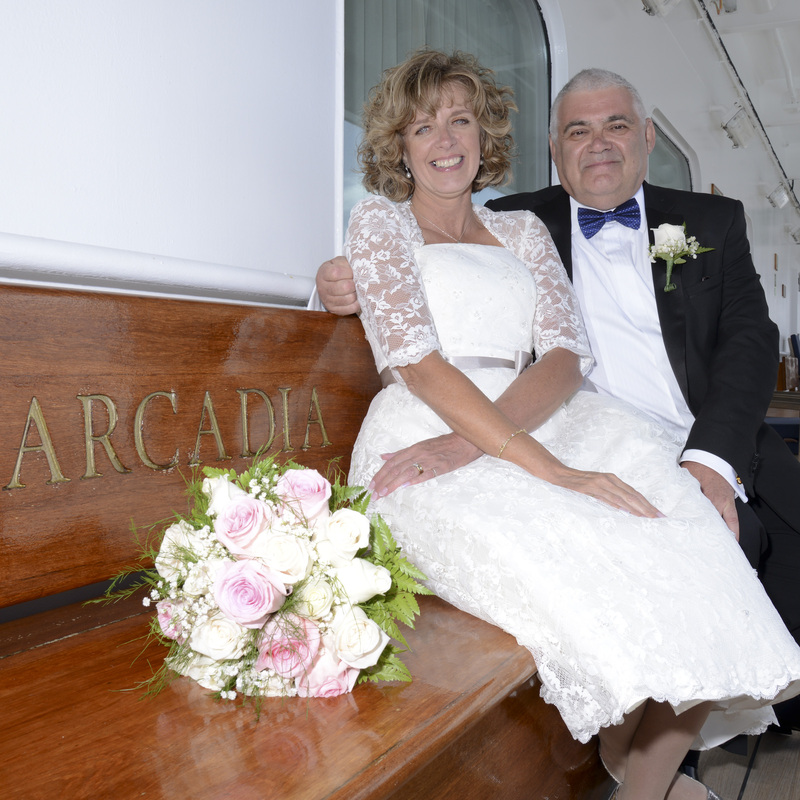 All we had to do now was wait for the 19th February when we would fly out to Auckland to join P&Os Arcadia. Then, sitting at home on the evening of the 6th February, the delightful Mrs Me (future) suddenly announced that she didn’t feel the dress was right after all . She had to have another one. The Alice Temperley was to become the evening dress (did I mention that Mrs Me (future) had already bought an evening dress?). So, trawling over the internet she found a shop in Newbury (Mrs Jones Bridal Boutique) that had a dress that she felt was just right. A couple of phone calls later, and she was booked in for a Saturday try out, subsequently followed by three amendment fittings and the dress was ready by the 15th February. I don’t know how much it cost, I do know how much the Alice Temperley cost but not the new number. I do however know that the cardboard box it came in cost £50. Come the 19th February, we flew out to Auckland, via Hong Kong, picking up many comments about the pretty box Mrs Me (future) was carrying. 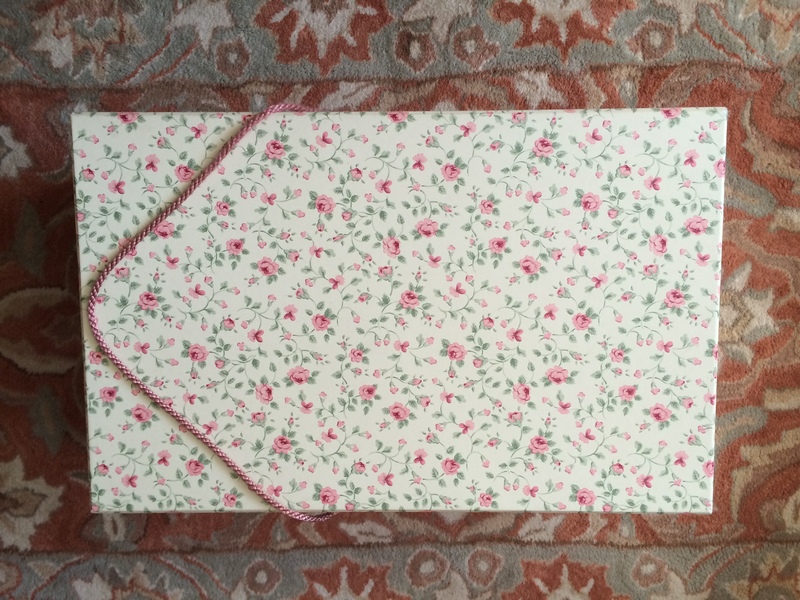 It’s my wedding dress she announced; it (the box) cost £50 I announced. Take that she said as she clipped my ear over and over again. At last however, we reached the ship and the confines of our cabin on the Arcadia and we settled in and having found the champagne that P&O had left for us, we spent the first evening on our balcony, chilling. 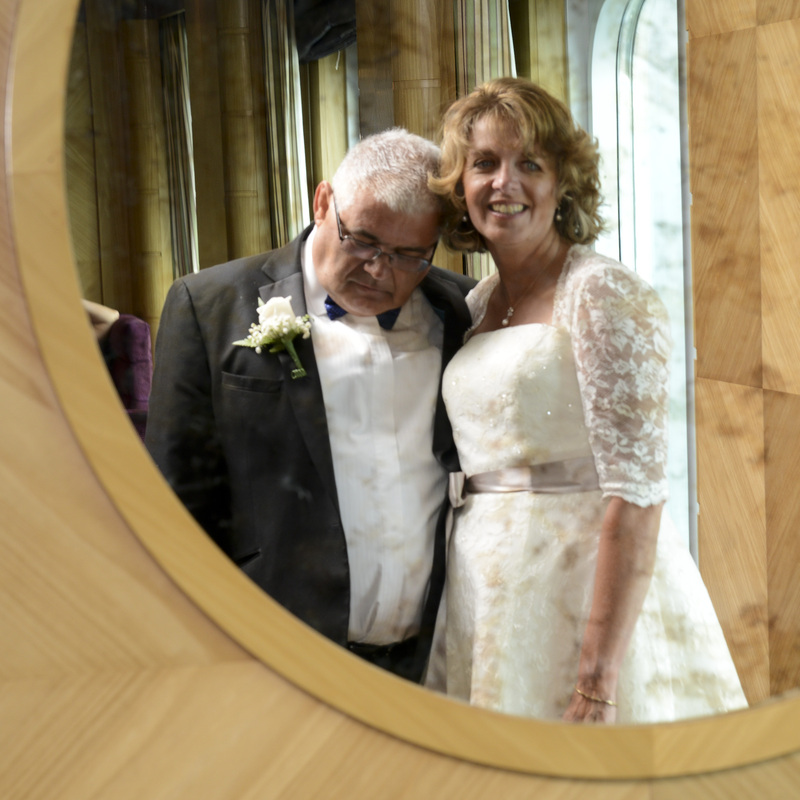 The next day, we met with our Wedding Co-ordinator, Ellie, from hereon to be known as Miss Ellie who ran us through the process and confirmed of course that we were who we said we were and took the particulars of our Best Man. 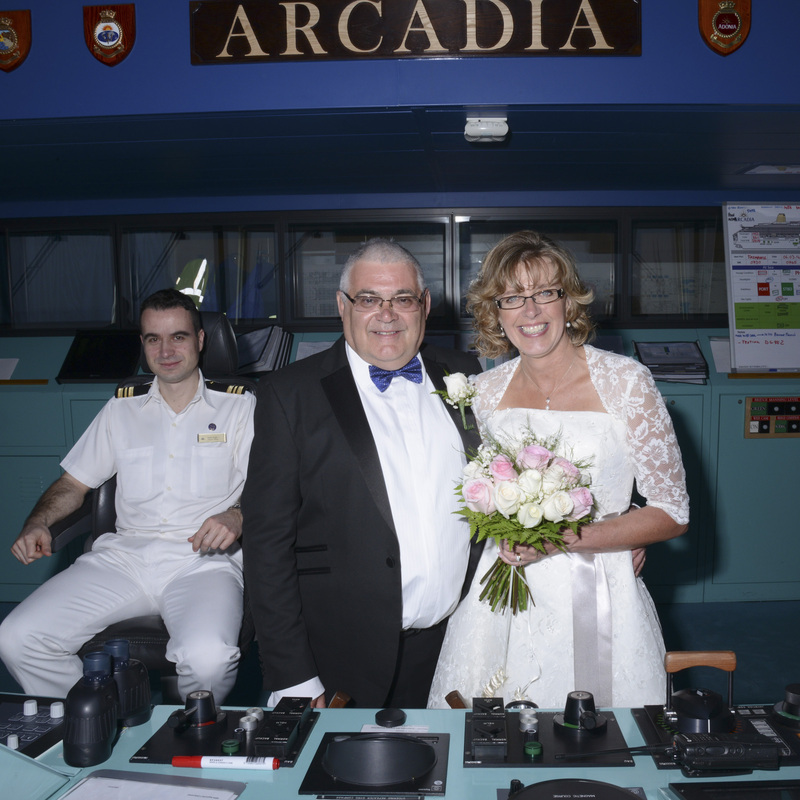 Jack was our Best Man, we met him the day before he joined the Arcadia in Southampton for the whole world cruise (we were just doing a leg of it) and as such he was our [kind of] advance scout. Little did we realise just how devoted to his new role he was. “Jack?” asked Miss Ellie. Yes, do you know him, we asked. Oh yes, he was a witness at another wedding three weeks ago. 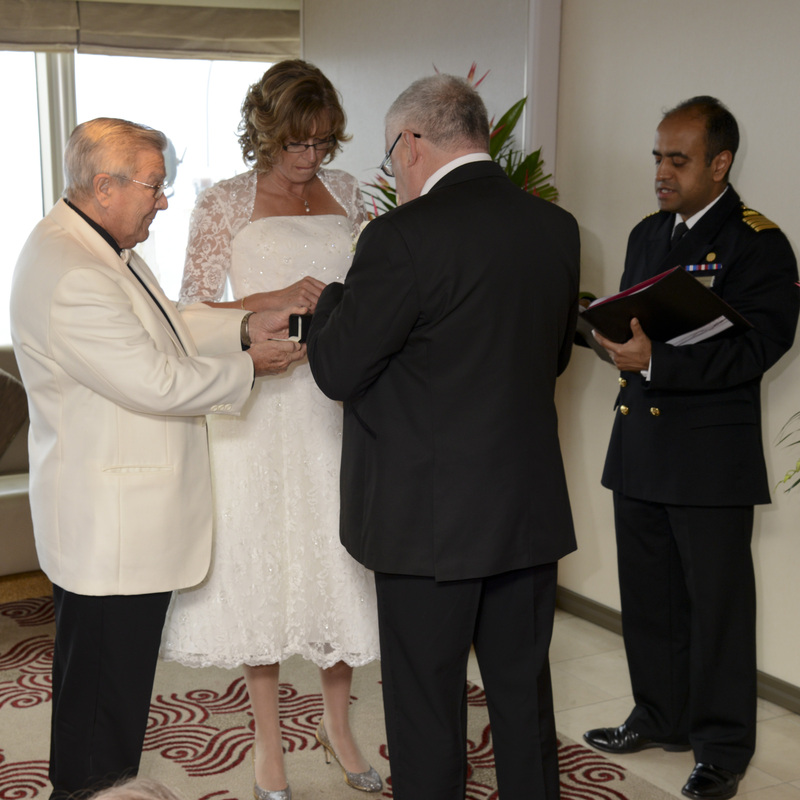 It turned out that a couple on his dining table were getting married at sea as well and when Jack told them about us and his role as Best Man, they asked him if he would be their witness: a kind of practice run. That’ll be him I confirmed and that was that. All we needed was another Witness, Miss Ellie would do this if we found nobody so we were just about ready. 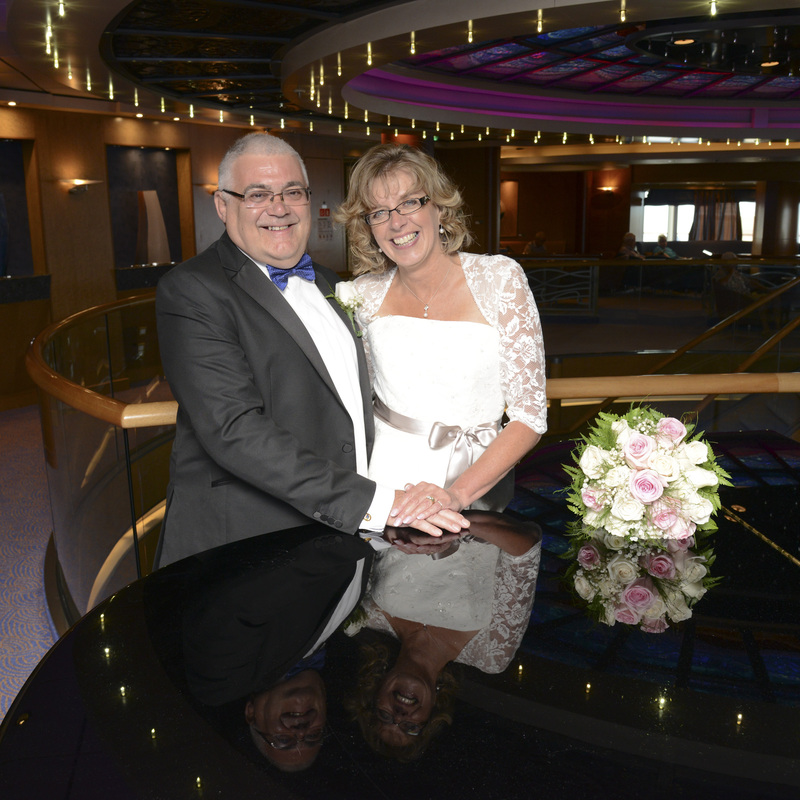 All we needed to do now was to arrange with the Ships’s Photographer to ‘do our pictures’ and a session in the Spa on the morning of the wedding. So, who would be our second witness? For our evening meals, we had opted for a table of six, that way you get to meet four new friends. As it turned out, two of our unknown friends had switched to the early sitting, so we just had the two remaining. Tim and Jill, as was their names, turned out to be a fantastic couple who did in fact have very similar personal stories as ourselves (no need to go into the detail) and they both in fact came from the Southampton area; given that Jack was from Portsmouth as was I, everything seemed so just right. And in due course, we asked if they would join us on our special day and for one of them, Jill, to be our second witness. Thankfully they agreed: in fact, Jill was more excited about the day than Debbie. The Big Day has arrived. The clock showed 08:30, I was on the balcony having my early coffee, watching the sea go by, wondering how the day would go. Would Mrs Me (future) cope with the pressure; would the dress be ok (believe it or not, I hadn’t seen it yet); would she get the words wrong; how would she cope with her lizard legs; would her hair be ok; would they (the Spa) do her makeup the way she wanted it These were all concerns I had. As for me, all I had to do was have a hair cut and a shave put on my best dinner suit and go to the bar 30 minutes before the allotted hour. At this point, there was a knock on the door. It was our Champagne Breakfast. This is a good start I thought, breakfast delivered to our room with a nicely chilled bottle of bubbly, to accompany a bottle from Mrs Me’s kind friends where she works. As we settled down to eat the door knocked again, it was another bottle of champagne from my lovely Sister. Obviously, we couldn’t drink it all but we could at least make a start. Today, I thought, was going to be a good day. Having breakfasted, Debbie had to go to her 09:30 appointment at the Spa. Mine however wasn’t until 11:00 so I settled back down on the balcony and had another welcoming glass of champagne before I too headed off to the Spa. On my way, I popped into the on-board jeweller and bought her a Clogau bracelet to go with her Clogau Necklace earrings that we bought earlier and gave it to her as a sort of pre-wedding present (must have been the champagne). Then, it was my turn for the pre-wedding treatment. I was greeted by the lovely Tania who explained that she would be giving me a nice haircut, nice shave, a facial plus hand, arm shoulder and scalp massage. The one thing she didn’t tell me was that she was also going to put cucumber like things on my eyes and a face mask. Fortunately, there are no pictures of this event but I have to admit, I did feel a new man and so chilled and relaxed (or was that the champagne?). I was now ready for the main event. All I had to do was change out of my shorts, sandals and t-shirts and squeeze myself into my suit and head on up to the Crows Nest to meet Jack, Tim and Jill and to be subsequently met by Miss Ellie. While we were waiting, Tim and then Jack obtained large whiskeys for me to settle my nerves. Once at the Crows Nest, my first task was to ask Jill if she would be able to go down to our cabin to make sure Debbie was ok and walk up to the Crows Nest with her. Well, I didn’t have to ask her twice, a big kiss and a big hug, and she was gone. At least I knew that Debbie would have some company and moral support for the long walk from Deck 7 towards the rear to Deck 10 at the front. This left just Jack, Tim and me to relax for half an hour, with another whiskey, when right on cue, Miss Ellie arrived with my Button Hole and reminded me how the ceremony and day would unfold and reassured me that I had nothing to worry about. Worry? Me? I don’t think so, I’m more worried for my future Mrs Me. 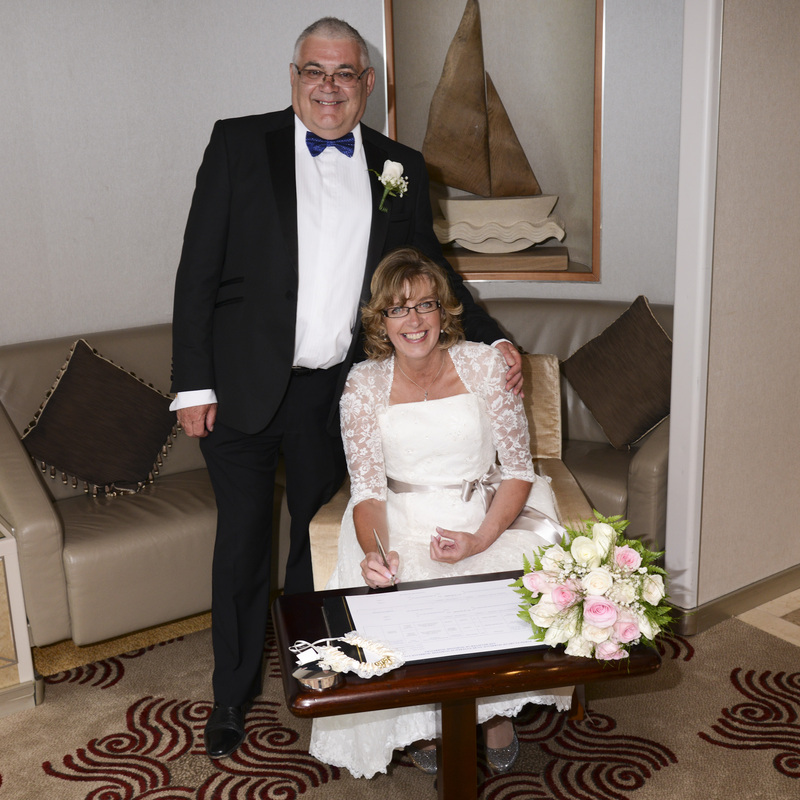 After being pronounced Husband & Wife, and the subsequent kissing and shaking of hands and cuddles it was time to sign the register before heading off for a series of photo shoots around the ship, starting with the Bridge. Adrian, the Ships Photographer took us around the ship making us feel like royalty as we moved from location to location to have those special photo’s to be taken. I have to say, he made us feel really special throughout the day. 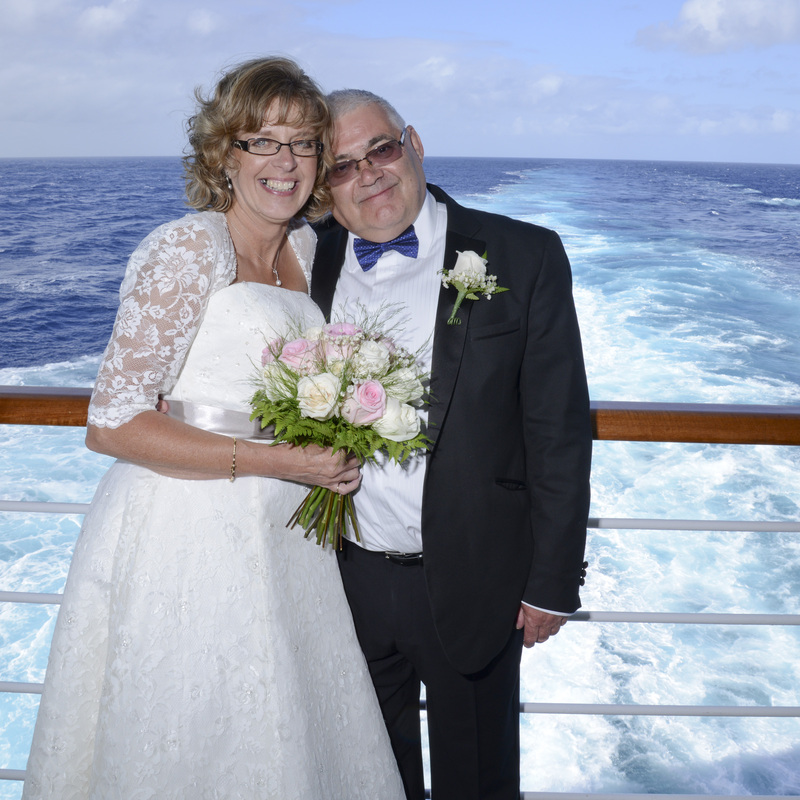 The plan was to get a couple of sunset photo’s from the very top on Deck 12 but the cloud cover prevented this but for all that, the day was a fantastic day and one I, and my Wife 🙂 would remember for ever. Throughout the whole shoot and the rest of the day in the restaurants, we were drinking champagne and the occasional whiskey to fill any gaps, so that by the end we were both feeling a little tired, as can be clearly seen in this last photo. The rest of the day became a blur, possibly due to whiskey and champagne and so with that, it was time for bed, once more on a different day to the day we actually got up. Ho Hum. 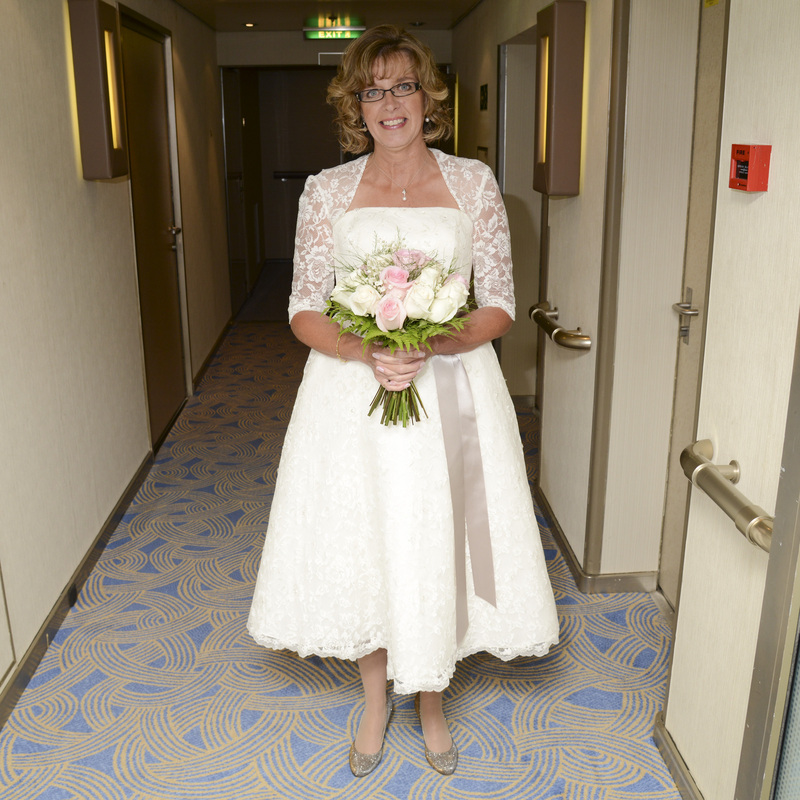 My original intention was to write the first blog of our Wedding Cruise on Day 1. Why not? It’s almost logical to start the blog with first day. On reflection, I’m glad I didn’t. The day started on Wednesday, our first real chance for us both to pack for what was to be a 3+ week cruise from New Zealand to Singapore during which time, we would be married at sea by the Ship’s Captain. Prepared? I don’t think so: we only had, after all, the best part of a year to get ready. 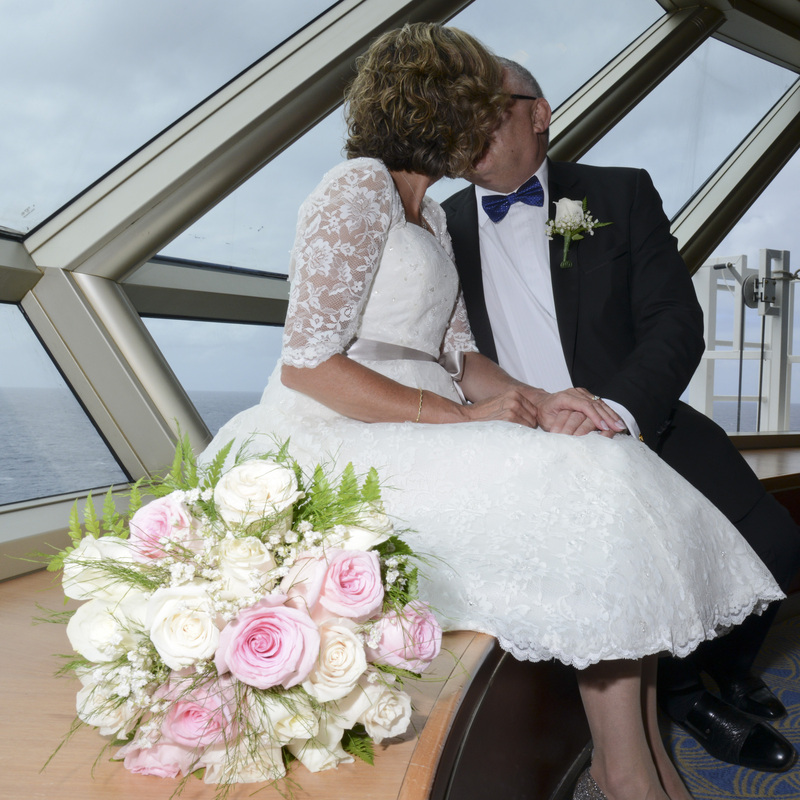 Granted, the wedding bit was a relatively recent enhancement to the cruise, though even that had an interesting ‘last minute’ twist. Let me explain, Debbie, quite rightly wanted her wedding dress to be just so but we were having trouble finding the right outfit. For my part, whatever she wore would be fine by me, just so long as she was there, but Debbie didn’t buy that. Eventually however, we wandered into an Alice Temperly store to find what was just perfect and at just £350 a snip. So that was that, dress sorted shoes could easily be sourced from Russell and Bromley – where else? All we had to now was await the day of departure but, just over a week before we were due to leave, the future Mrs Me declared that she wasn’t quite sure about the dress, although she did agree it would be good for the going away evening (we’ll be on a ship so not sure where exactly she thought we’d be going away to). However, a quick trawl through the Internet, she identified a bridal wear outfit that would be so must better. So, a couple of a frantic phone calls and an emergency fitting was scheduled for the next day to be followed up by three additional fittings, all in the space of 7 days. I’m still not clear what it cost but I do know that cardboard box it came in, cost £50! I shall give my verdict on the dress on the 5th March, the day after our wedding. Anyway, back to day 1. Our flight was scheduled for 18:05 with Cathay Pacific; first to Hong Kong, then a change of planes for the last leg to Auckland, New Zealand. So we left on Wednesday (mid-day to get to the airport in good time) and reached New Zealand on Friday and embarked the Arcadia at mid-day on Friday. By this time, we were both extremely tired and grouchy (a grouchy Mrs Me, you really don’t want to meet and yours truly isn’t a lot better) so inevitably anything that didn’t go like clockwork seemed inordinately and disproportionately unacceptable and we wanted blame everybody and everything for all of it. But me, being the sensible one ☺ kept saying to let it go and we’ll see how it all is in the morning. 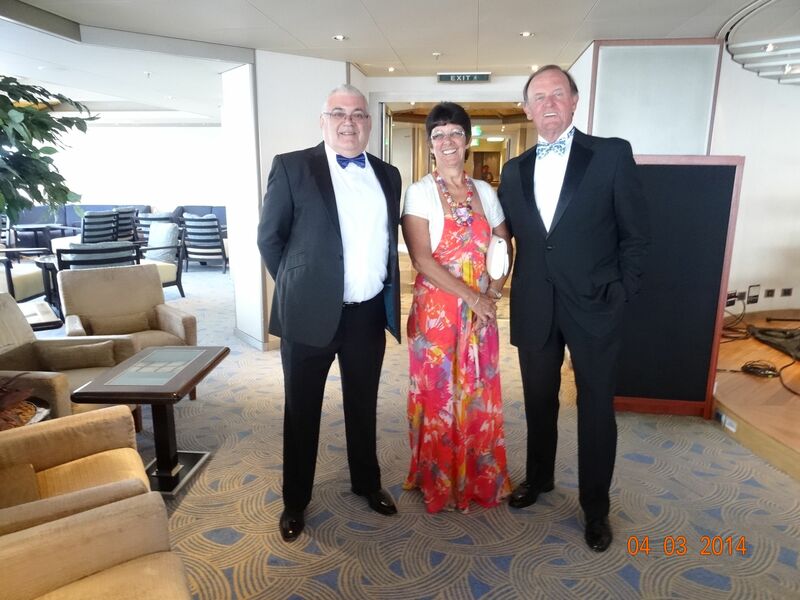 And so we did and we agreed to have our evening meal on our balcony as we sailed out of Auckland Harbour and onto the Tasman Sea bound for Sydney. 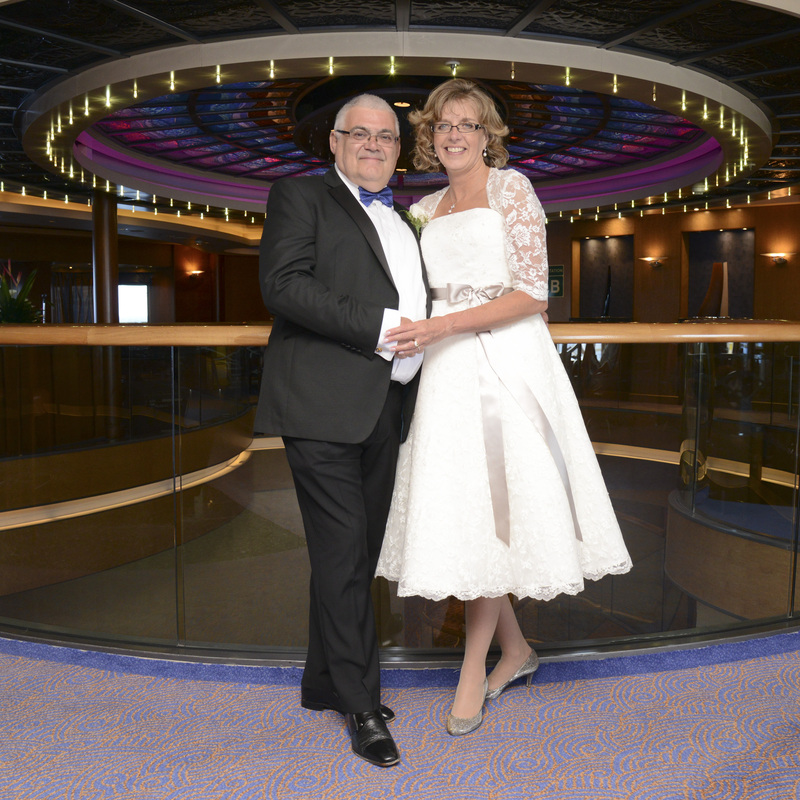 On reflection, all that went before the morning after wasn’t really that bad and we are once more settled into our rightful place on board a P&O Cruise Ship, this time – The Arcadia. 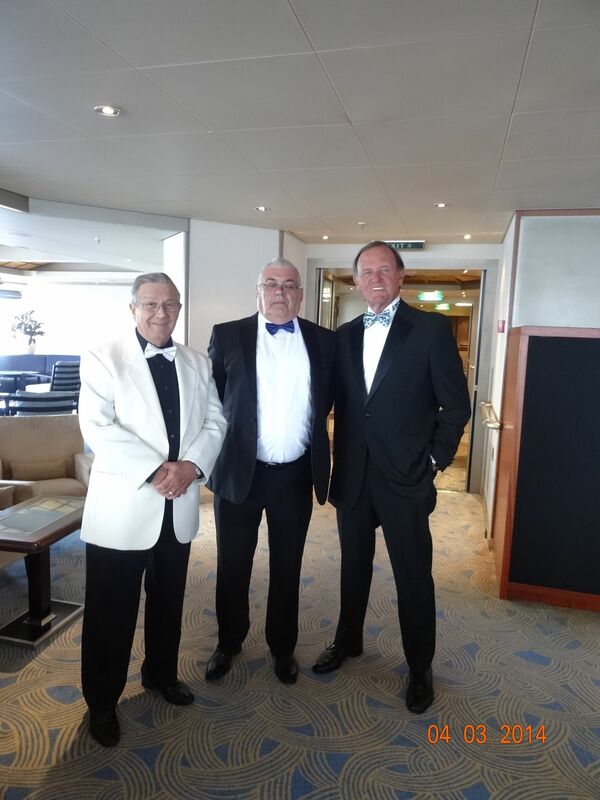 And once again – and really big thank you to P&O for this – we were upgraded to a Mini Suite. And yes, it is ‘fab_u_lous darling’. I regret to say that for our retirement world cruise, a Mini Suite it will have to be. It is so worth the extra money. Having completed all our chores we had that well needed afternoon glass of Pinot Grigio Blush before dinner and an early night in readiness for two whole days of doing nothing but sit on our lovely balcony (the biggest we’ve had so far) and soak up the sun’s rays as sailed across the Tasman Sea heading for Sydney. We knew we’d need the rest, as we would have to up early on the day we sailed into Harbour to be sure we didn’t miss out on the whole ‘sailing in’ experience. “With so many things in the sea, you’d think we’d see some of them” mused Mrs Me as she sits on the balcony watching the Tasman Sea drift by. “Oh yes”, said Mrs Me and back to sleep she went – stirring occasionally to moan that the sun was too hot, put on more sun lotion before going back to the land of nod. Cruising was invented for Mrs Me.